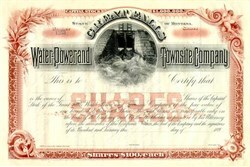 Beautifully engraved unissued Certificate from the Great Falls Water Power Townsite Company dated 189_. This historic document was printed by the American Banknote Company and has an ornate border around it (with an angel) and a wonderful vignette of water flowing through the gates of a dam. This item is over 100 years old and looks great.